"Canoncito N Mx, Nov 24/79" (Sante Fe), manuscript postmark and cross-hatch canceling 1¢ postal card to Waterbury Conn., Nov., partial arrival cds, message datelined Conocito Nov. 22nd reads "…Arrived here Wednesday after a long and tiresome journey…", Very Fine and unlisted manuscript town postmark, Helbock R9. 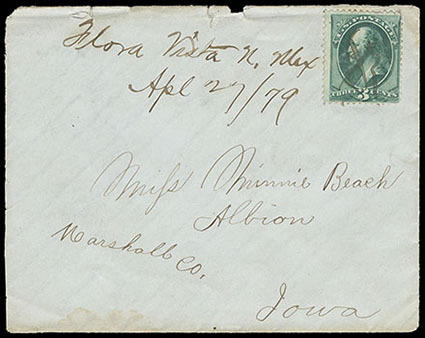 "Flora Vista N. Mex, Apl 27/79" (San Juan), manuscript postmark and matching ms. "X" on light blue cover to Albion Iowa; top edge flaws, Fine and unique example of the type 1 postmark, Helbock R8, ex-Welch. The Flora Vista post office opened in 1878 and operated until 1883 with two names, then in 1884, the post office changed names to an improved single-name of Floravista. Kappus, N. 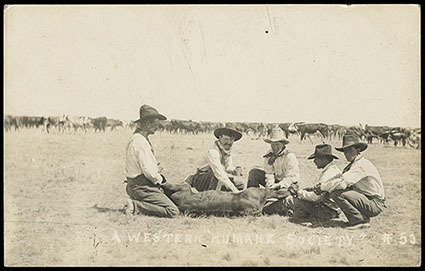 Mex., Sep 8, 1910, Type 1 duplex with four-bar killer ties 1¢ Franklin on post card to Grant Mich., picture side with real photo titled "A Western Humane Society" showing cattle branding, Very Fine and choice, this is he earliest of only two recorded examples of this postmark. 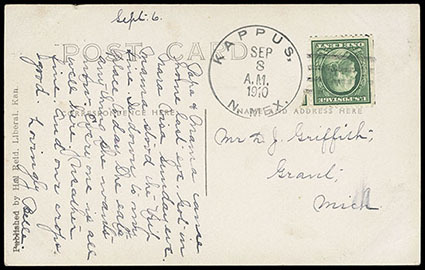 Kappus was a short-lived DPO open from 1910 to 1913. 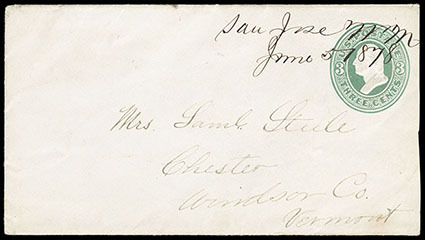 "San Jose N.M., June 5 1878", manuscript type 1 postmark on 3¢ green entire to Chester Vt., enclosed letter datelined "San Jose, New Mexico Terr. 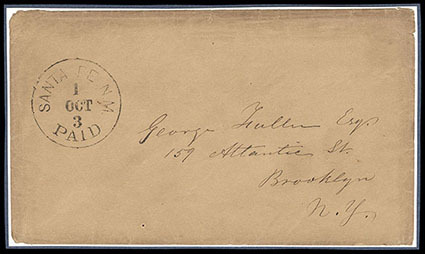 June 1878" by William Steele to his mother mentions of his travel plans in the territory and where to direct his mail; reduced slightly at right, Very Fine, One of only 3 Recorded Manuscript Type 1 Postmarks. Todsen R8. (1846-48 Mexican War) "Santa Fe, New Mexico, January 11th, 1847", dateline on folded letter from Army surgeon to his wife at Fort Leavenworth Mo., carried by military express, entered mails with "Independence, Mo. Mar 3" cds and manuscript "5" rate marking, some interesting content describing sickness, death & battles including "…We have had a battle at a place called El Passo about 200 miles from us in which our troops came off victorious and I am in hopes that the war will soon be over…"; light toning, Fine and interesting Mexican War use. 1849 (Jul. 8) Sante Fe, N.M. Terr. 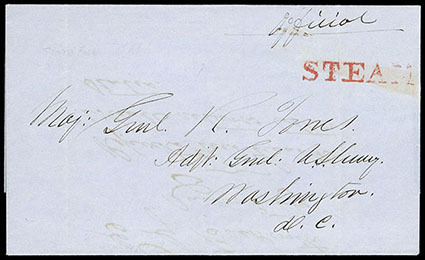 to Washington D.C., blue folded cover docketed from E.G. Beckwith to Maj. General R. Jones, Adjutant Gen. of the U.S. Army, endorsed "Official" at top right, entered mails with St. Louis red "STEAM" straightline, Very Fine. 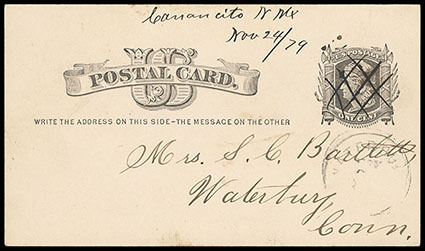 Since there was not yet a mail route on the Sante Fe trail, this was carried by military courier to Fort Leavenworth. 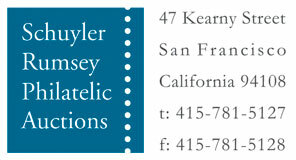 There, it was place aboard a Missouri River steamboat that had no mail contract. On arrival at St. Louis, it entered the mails for the east with the "Steam" straightline. Santa Fe, N.M., group of 4 territorial usages with different postmarks comprising "Santa Fe, New Mexico, May 1" cds and "10" rating handstamp, "Santa Fe N.M., 1 Jan" cds and matching "10" in circle rating handstamp Official Business to Washington D.C., "Santa Fe N.M. '3 Paid' 1 Oct" integral-rate cds to Brooklyn N.Y., and #26 tied by "Santa Fe, N. Mex, Jun 24" cds on 1861 cover to Bristol R.I.; some faults, F.-V.F.